The violence, rioting and destruction that followed the grand jury’s decision to not indict Officer Darren Wilson in the shooting death of Michael Brown is inexcusable mayhem fomented by race-baiting anarchists. Criticizing and second-guessing 12 citizens, who served in good faith as grand jurors, also is an exercise in futility, because only those people were privy to all the evidence and testimony of witnesses. But I certainly understand the frustration, anger and reasons behind the backlash of protestors from coast-to-coast. Unfortunately, thousands of smart reporters and media commentators don’t, and have failed to acknowledge two critical factors: 1) Millions of Americans no longer trust law enforcement officers to conduct honest, thorough investigations, and 2) cops lie. The impacts of those simple truths cannot be overstated, particularly in minority communities and among families and friends of police-shooting victims. While pundits and reporters are hailing Prosecutor Robert McCulloch’s grand jury process as wonderfully transparent, skeptical Americans still wonder: How valid were the data and information given to the grand jurors? How honest were the officers and federal agents, who conducted the investigation, interviewed witnesses and compiled, then analyzed, the forensic evidence? What influence did police unions exercise, during both the initial investigation phase and the grand jury proceedings? How much political pressure did investigators endure, and did they shade their findings accordingly? And, finally, did the historical, pro-police bias of the primary prosecutor, Robert McCulloch, taint the end-to-end process? These and dozens of other questions arise, as just-released documents are scoured by pro-police apologists, as well as by activists intent on exposing yet another case of law enforcement/judicial system corruption. But many of the right questions will go unasked and, almost assuredly, unanswered to the satisfaction of Michael Brown’s family and supporters. There already are red flags waving. Many of the same old, trite dismissals that follow egregious, controversial officer-involved shootings (OISs) are surfacing: We’re committed to uncovering the truth. We conducted an exhaustive investigation and found that Officer Wilson acted appropriately. It’s time to move on. Don’t worry; we’ll continue to examine this case and make any necessary changes to policies, procedures and training to MAKE SURE THIS TYPE OF TRAGEDY NEVER HAPPENS AGAIN. How many times have victims’ families and minority communities heard that hollow, insincere line? Too many to count. Despite nationwide outrage and increasing media coverage, the law enforcement and judicial communities remain woefully ignorant of a massive, very smelly elephant standing in their midst: Only a rapidly shrinking percentage of America’s population believes sorry, unlikely tales spun by street cops, detectives, prosecutors and other legal system functionaries. Cops’ credibility is shot, and few people believe anything a police officer claims these days. Why? 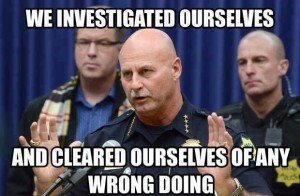 Because thousands of killer-cops routinely panic and fire, before thinking, then corrupt crime scenes, “disappear” incriminating evidence, manufacture bogus “evidence,” illegally break into victims’ homes and cars, manipulate and badger witnesses, refuse to challenge unlawful acts of their fellow officers, then blatantly lie under oath. Yes, many police officers are good professionals, who take their oath to protect and serve seriously, and do their best to live up to that promise every day. But these are fast becoming a minority. Today’s young “Thirteener” cops—scared nerds and gutless playground bullies, who were raised on violent video games, never played a contact sport and have never been in a fistfight—are slowly replacing honest older cops. And the more seasoned, older generation has little respect for their younger, more volatile colleagues. Millions of Americans no longer respect police officers, because “Thirteeners” have literally poisoned the well of law enforcement integrity. In fact, corrupt cops are so despised in a few communities that entire police departments are being disbanded. Cops, in general, have zero credibility today, because far too many of them are angry, steroid-fueled cretins, who never hesitate to “go lethal,” when faced with potential conflict, then lie about killing an innocent citizen. Older cops still believe in the use-of-force spectrum, and initially try to defuse a situation by using their brain and their mouth (talking). If necessary, they then employ a baton, maybe a Taser and, finally, their gun. But most complete an entire career without having to fire their service weapon to protect themselves or others. I feel sorry for these older veterans of police work, who have put their lives on the line for several decades and are proud of their accomplishments. They’re embarrassed and frustrated by quick-to-shoot, dishonest, younger compatriots, and alarmed by vicious backlashes against them, such as seen in the aftermath of the Brown/Wilson verdict in Missouri. However, we citizens also must challenge older officers to step up and demand that police chiefs, sheriffs, prosecutors, judges and federal agencies hammer corrupt “Thirteeners”—out-of-control rogue and outlaw cops. Department leaders should encourage whistleblowers to expose and testify against corrupt officers, then protect those with enough courage and intelligence to do so. Finally, good cops should abandon police unions in droves, turning their backs on once-legitimate organizations, which now encourage lawbreaking and help cover up malfeasance committed by their badged flocks. Unless honest, professional police officers aggressively weed out rogue cops, and demand the entire national law enforcement community restore a culture of honor, they, too, will be at severe risk. Otherwise, when they take the stand to testify against a vicious bad guy, nobody in the jury box will believe them. That’s when the American judicial system—the one touted as working so well in Ferguson—will crumble. What then? Nationwide chaos, with armed, furious citizen-soldiers literally hunting cops. And the end of a free America.